What is the Book of Song? 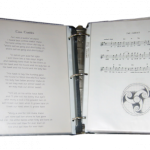 In late 2008 I was getting tired of lugging around the thick three ring binder that held all the songs my little troupe of folk musicians had learned up to that point. 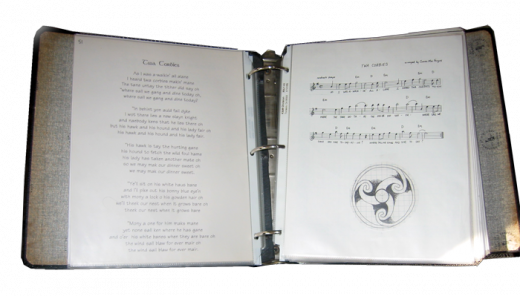 Over time the lyrics to the songs we did, complete with chords and sometimes with some of the history behind the tunes had been stuck into a binder. The separate sheets had ended up in plastic sheet protectors, and I'd gone so far as to create a table of contents page just so I could actually find a specific song in what had become a huge tome of tunes. This meant I had to pencil in page numbers on each page and keep the pages in order in the binder. The book had grown to several hundreds of pages thick and was ornamented here and there with artwork I (and others) had drawn, it included some sheet music for melody lines to the less well known songs or instrumental pieces which were included in haphazard fashion but the thing was growing too darn heavy, and keeping up with the Table of Contents was a pain. We each had our own books that had grown in similar fashion so we wouldn't have to look on with each other when we got together. The different books might have notes specific to the part we played, sometimes things were crossed out or alternate keys were scribbled in. It was hard to mark up the sheets since they were in sheet protectors - if something changed you had to take them out first which was a pain. 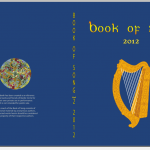 I decided that I'd compile and lay out a complete "Book of Song" with all our notes which we could print using an online print service (I'm a fan of lulu.com) so we could each have a nice professional looking bound copy. This would also serve as a sort of "yearbook" marking all the tunes we knew to that point. 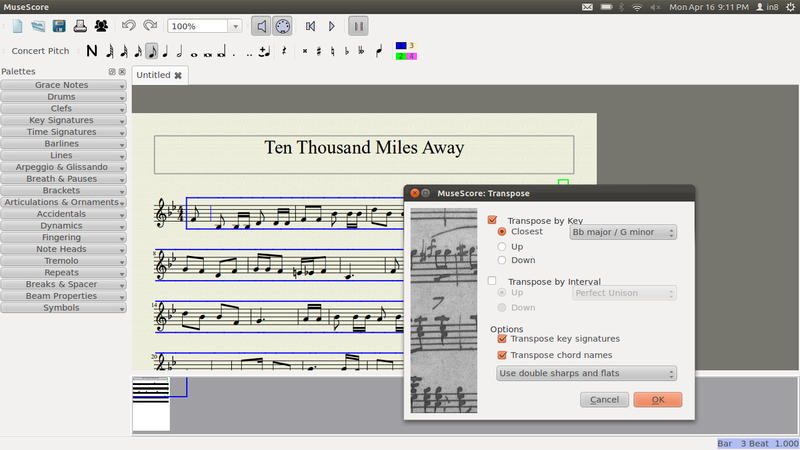 Its now many years later and the time has come to make a new Book with tunes learned since the last volume was created and this time I wanted to do it all with free software if I could. This is the story of how I created these two song books. Warning: this is a LONG post. The first Book of Song actually grew on the web. While its true that I had a physical three ring binder that I'd lug to sessions and jams, the songs themselves had usually been posted to our group's website and formatted there first (chords were just font classed a different color as were the song titles and so, these were "tagged" in a kind of XML-ish way). My workflow back then was different in this regard as after 2010 most of our new songs didn't make it up to the web at all. There were a few reasons for this: the new songs I was learning weren't as relevant for readers of the website where the original book had evolved; also I was worried about the copyright on some of the songs getting me in trouble if I posted them on the web. Lastly, I had photocopied some newer tunes out of other music books and they were already formatted quite nicely - translation - I got lazy. But anyway, back in 2008 I had the bulk of the tunes up on the web. They were "book page nodes" in a drupal CMS website and I had to design a workflow to get them out of there, preserving the formatting as much as I could. The best way I could devise at that time was to use Adobe InDesign, a program we had used at work for many years to create product manuals to do the book's page layout (before InDesign we had used Adobe PageMaker so I was sort of myopic about this kind of software). InDesign was able to import XML, and I found I could export the song nodes en masse from Drupal to a sinle xHTML page and then use a program called tidy to clean it up a bit. In Drupal, the song pages were all "sub" to one page, so I could just choose "printer friendly copy" from the top most page and get a single xhtml page with all songs on it, preserving the font classed chords and song titles. Then I could just save that, add a quick line to add a page break right before each song title, clean up some of the drupal crud with tidy and import it into InDesign in one go. It worked. 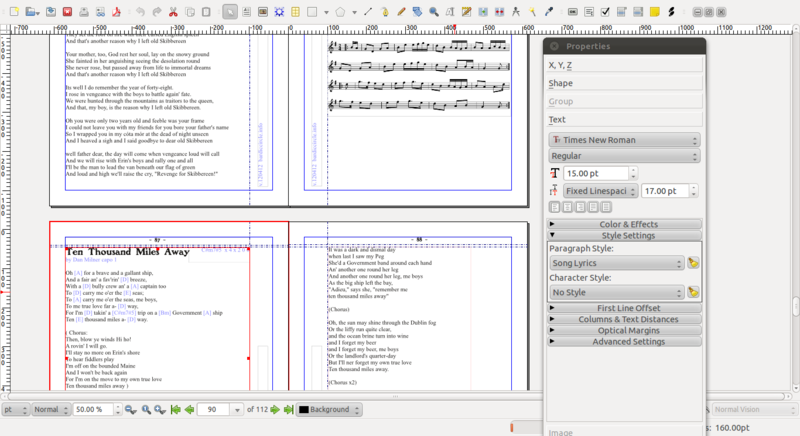 I was able to map the chord and title classes to styles in InDesign to create a consistent layout throughout the book. I still had to manually insert images and sheet music as needed on pages, but it saved a lot of time and the first book at something like 248 pages was born. When making the first book I chose to create a custom wrap-around cover in Photoshop and not use lulu's cover designer software. 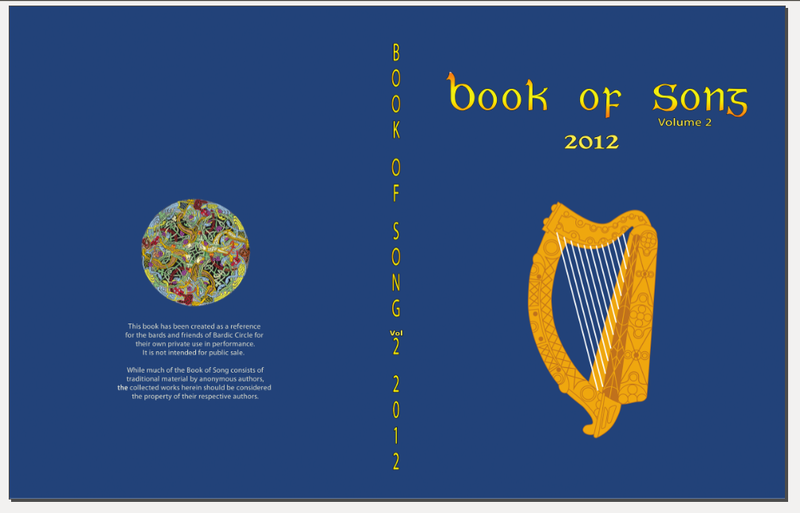 I wanted to have a harp on the cover and Gaelic lettering, an image on the back and some text. I had used Photoshop for years at work and was very familiar with it, so this was the natural choice for me. Doing a custom cover is a little tricky because you have to know how many pages thick the book is going to be first in order to determine the spine width before you can know the width of the cover (in pixels). lulu has a calculator to help with these calculations. Gimp is the open source alternative to Photoshop and at the time I was just not up to attempting this kind of work in anything but Photoshop. When I finally finished the second book, I considered re-creating what I already had done in Gimp and realized it was probably not worth the effort. So in the end I ended up just firing up PS in a virtual machine (luckily I had a VM from work with Photoshop installed) and making a few modifications to the old cover: adding "Volume 2", changing the verbage on the spine, changing the background color. The songs we had learned since 2009 for the most part had never made it up to the web. Some had, but not enough to make it worth attempting any kind of export / import as I had done the first time. The first book was well over 200 pages, and it looked like I'd only be at about half that size for the new book, so I decided I could proceed manually this time without too much hardship. Most of the work in building a book like this isn't in the layout anyway. My workflow for putting together the book starts with a guitar in hand. Each song, in turn is worked through chord by chord either following a specific version I have a recording of or have found on Youtube (lots of Youtube views go into each book) or for the older, less popular tunes picked out from sheet music found in other music books till I can put together the entire song as a fully fleshed out piece. For a song I don't really know but that someone else in the group has suggested, this might take a couple hours if I can find enough source material. Sometimes I can find lyrics online (which might need to be changed to match a particular version we want to do) and other times I've had to just type as fast as I can while I listen to a recording over and over till I get the whole thing down. I can usually find sheet music for the melody line at The Session or The Mudcat Cafe, but I'd be lying if I said these were the only sources I've used. There are so many folks out there sharing old tunes and lyrics and I just haven't done a very good job of bookmarking them all to share with you here, sorry. I also wanted to try to use open source (and free) software for the new book as I've mostly moved out of my old Macbook and into a Linux laptop so I wouldn't have InDesign or Photoshop handy and I really wanted to be able to do all the work on a single machine. While InDesign might run under wine (I don't really know), I didn't feel like jumping through hoops just to use that program when I didn't have a Windows license for the software anyway. 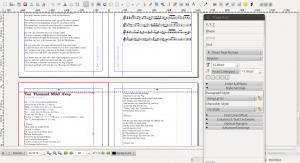 The closest thing I've found to InDesign in the FOSS world is Scribus but I had only looked at it briefly in the past and this was the first real project I would ever try to use it for. I would have to learn everything I needed to know about Scribus on the fly. Before long, I realized that the images that I used in a Scribus document are linked into the document - not embedded in the document. If you put an image into Scribus, it doesn't "go into" Scribus, it stays wherever it was and a link is put into the Scribus document to that image (although it appears to be "in" Scribus). If you delete the image or move where you are storing the image or move the Scribus document away, the link is broken and you will only see a square with an X in it. If you edit the image in an image editor, the change will be reflected in Scribus when you view the page on which it is linked (although you will likely need to do some tweaking for placement if you do this). 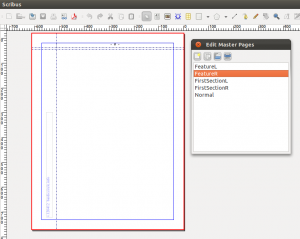 For this reason (and others) the first step is to create a project folder to hold the Scribus document and any associated files you want to "put into" Scribus. My folder structure (when I was done with the project) is shown here. 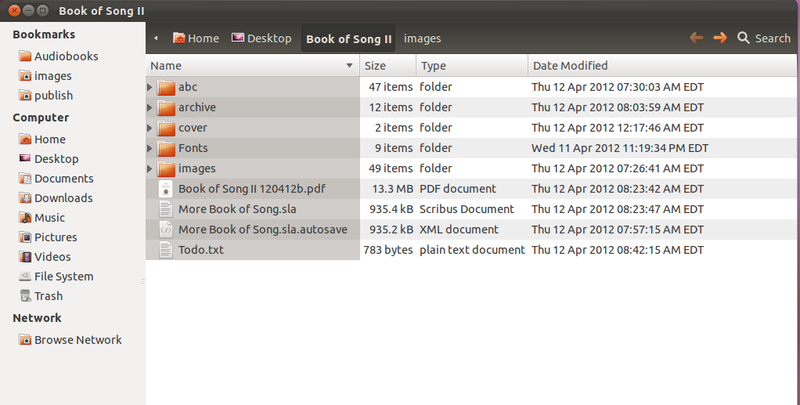 The Scribus document (More Book of Song.sla) is shown here with several folders inside a project folder. The folder images holds all the pictures I placed into the book, abc has the original abc files used for the sheet music, archive was created to store PDFs (I was always creating new PDFs to review and this folder held the old ones just in case), fonts was a place to keep a copy of the special fonts I used (not necessary for the Scribus document, but if I moved to another machine that didn't have those fonts I wouldn't have to go crazy looking for them again), and cover holds the Photoshop file and PDF of the cover). 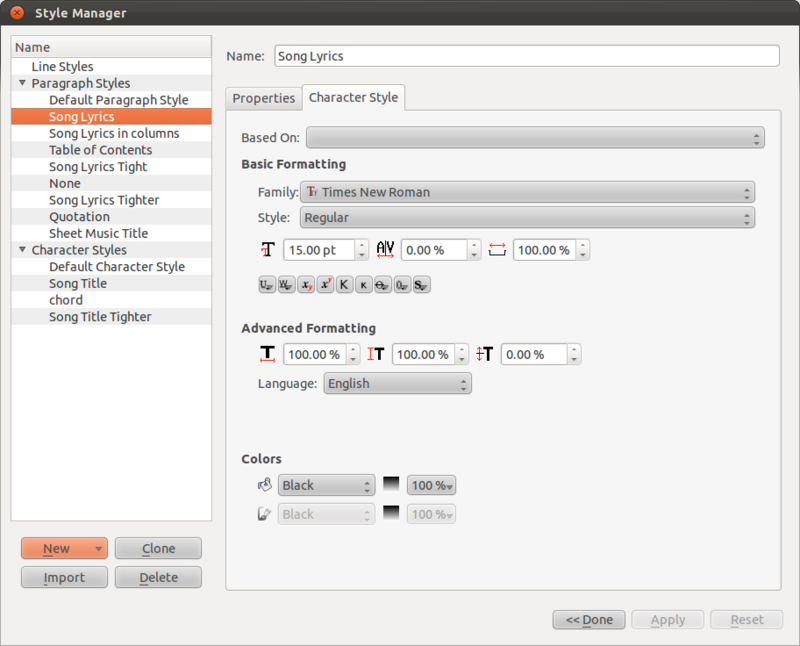 Scribus may create an auto-save file (as shown). I also kept a todo.txt file for things I needed to fix as I went along, but couldn't get to right away. I've learned from the tech writer at work that the first thing you need to do before starting a project like this is to define styles. For writers who have worked on manuals for helicopters and the like this kind of thing is just obvious. You can't just toss off a complex manual, you need to sit down and decide how every last item in your manual is going to be presented - exactly. You need to ask questions about the format and answer them in the styles. You need to define margins, type face, size and spacing, what the titles are going to look like, will there be a line diving paragraphs? How will images be preseted, figures, diagrams? What will the Table of Contents look like? What things will be found in that Table of Contents? Basically you have to think through the whole project and define every possible scenario. You do this using "Styles" (and in Scribus and InDesign, Master Pages). I was not writing a manual for a helicopter but I knew I had to define a bunch of things. There would be song titles which would show up in the Table of Contents, there would be song text, in the song text paragraphs there would chords which would present in a different color, there would sometimes be columns and the text would need to be smaller in these, there would be quotations, there would be images with captions, there would sheet music, pages would be numbered. It was a lot of stuff to define. I started off with the Master Pages. This is a way that you can define the things that happen on every page. Page numbers are a good example - and I wanted mine to have little tildes on either side like the original Book of Song I received from Kevin Reagan in 1990 which had been hand written. I wanted a web address and a revision on every page buried in the margin so in case a page got photocopied out of the book it would have some identifier. There were left and right master pages since when you're printing a book the page on the left has more space on the right side and a page on the right has more space on the left as thats where the pages are bound to the spine. This shot shows a right hand master page. 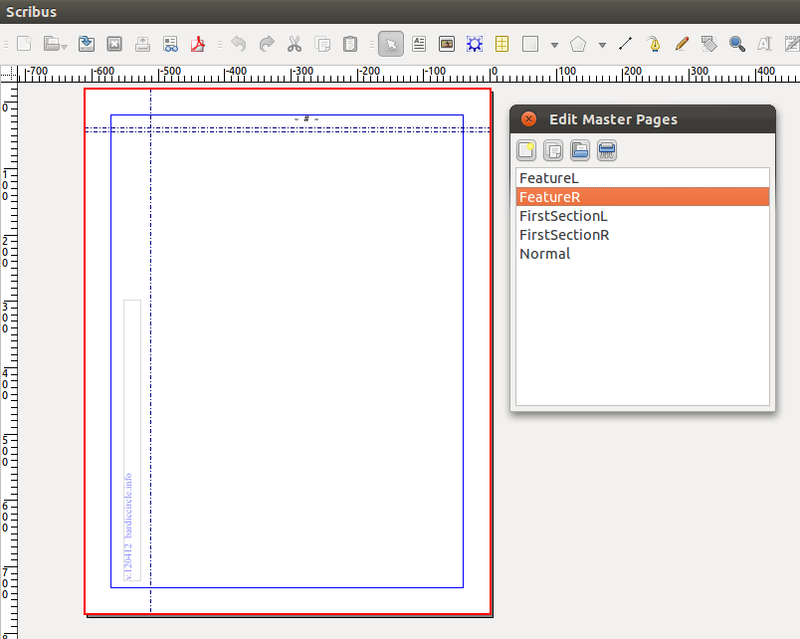 You'll note there are a few other master page possibilities in the Edit Master Pages dialog box. I also needed different master pages to handle the overleaf and the table of contents. I had to decide on and set up each of the various styles I needed in the Style Manager, though I have to admit I didn't realize I'd need all the styles I ended up needing. 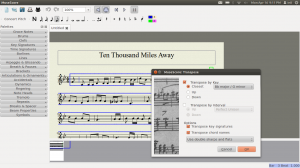 Using Scribus is not exactly like using a word processor, but its fairly similar. Once you open a document and have a page (or multiple pages) available in which to put something, you have to decide whether that something will be text or image. Select one of the two icons to the right of the arrow (selected) along the top in the icon toolbar shown below (either text or image), and then click and drag a box in the page. This creates a text or image box in which to put some appropriate something or other. Once you've created a text box you can just click into that box and paste in some text. This text is pasted in as the "default" style. This probably isn't what you want. Right clicking on the text or image box and choosing Properties brings up the Properties box. The properties box is really important in Scribus. In the image below I have selected the text box which contains the lyrics from the song Ten Thousand Miles Away and have selected the paragraph style "Song Lyrics" (previously defined as Times New Roman 15pt). Each of the blue chords in the paragraph have been individually selected (or copied and pasted) and assigned the character style "chord" (based on Song Lyrics paragraph style but colored light blue). The song title similarly has been selected and applied with the Song Title character style (defined as Benjamin Franklin, 24pt). Styles make it very simply to update the look and feel of the entire document without having to go back and select all the various places where that style has been applied, you just change the style. 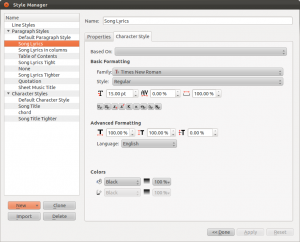 Once you have defined and applied paragraph styles (like the main song lyrics) and character styles (like the chords and the titles), you can simply edit the various styles to change any place where that style exists in one go. For examplem if you later decide that a non-serif font should be used where you previously had the style as serifed, just edit the style in question and the entire piece is instantly changed. One of the things I wanted to include in the Book of Song was music notation (sheet music) for as many songs as possible. I've used abc notation for years (and have written about it before in 2005) so I won't re-hash it, but I was able to process some of the hundreds of tunes I have in this format, and use Musescore to transpose the tunes to match the guitar chords where possible. Why aren't you trying to sell me something? If you've read this far you might be wondering why I haven't linked to my Books on lulu here. Well, the point of the project isn't to make money selling a book filled with songs I didn't write, even if most of them are traditional folk tunes and in the public domain - its a workbook for my friends and I to learn the songs we like so when we get together we're "on the same page", as it were. The fact is that there are some tunes included that are NOT in the public domain and I'm not very excited by the prospect of getting a letter from some asshat lawyer at a publishing company who says they own the rights to some song lyrics I happen to like performing. If you've read this blog for any length of time you know how I feel about this sort of thing, but at the same time we have to live within the law. So, if you want a copy - contact me and I'll shoot you the link, but no, I don't run a public store selling these books, thanks!